Electrocardiography (ECG or EKG) is the study of the heart's electrical activity, most commonly recorded via placement of electrodes on the skin. Human and animal ECG signals can be recorded for easy processing of heart rate, heart rate variability, analysis of the waveform morphology, and similar functions. The sinoatrial (SA) node acts as the pacemaker of the heart. These cells rhythmically produce action potentials that spread through the muscle fibres of the atria and ventricles. The resulting contraction pushes blood into the ventricles, and then out into the vasculature. Innervation by the parasympathetic and sympathetic nerves can modify the basic cardiac rhythm e.g. 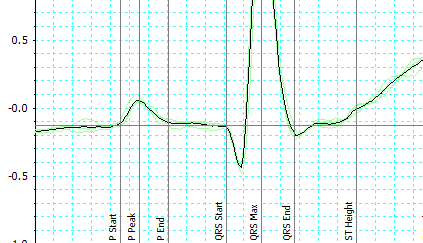 as occurs in sinus arrhythmia. Similarly, heart rate can be influenced by activity of the sympathetic nervous system due to change in emotional and cognitive state. To reduce noise in your ECG recording, avoid placing electrodes over large muscle groups e.g. Biceps, where possible. 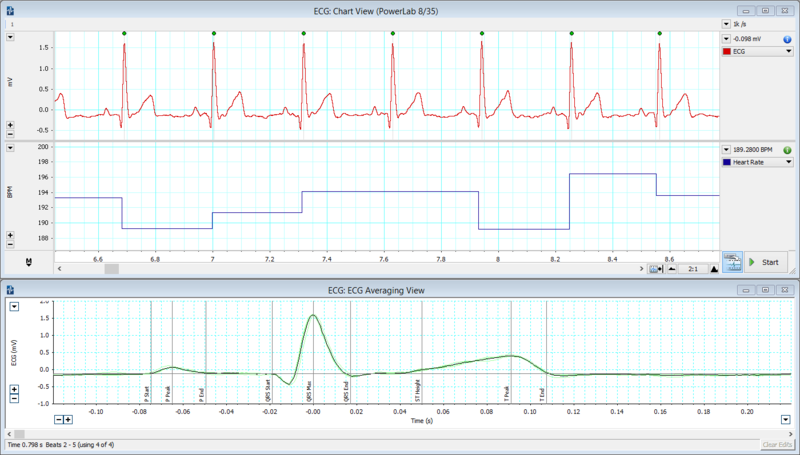 The ECG (EKG) Analysis Module for LabChart automatically detects and reports PQRST onset, amplitude and intervals in real time, or after recording. Thank you for your interest in ECG. Please complete and submit the form below and an ADInstruments representative will aim to get in touch within one working day. If you’d like to speak to someone immediately, office contact information is available from the contact page.